Aluminium strip or aluminium tape is a kind of aluminum product in tape shape, it has the same physical and chemical properties with aluminum sheet, but in common, the aluminium strip is a little thinner and the width is shorter, basically 50mm to 1500mm. The grade we can seen in aluminium strips are 1050, 1060, 1070, 1100, 3003, 3004, 3104, 3105, 6061, 8011 and so on. 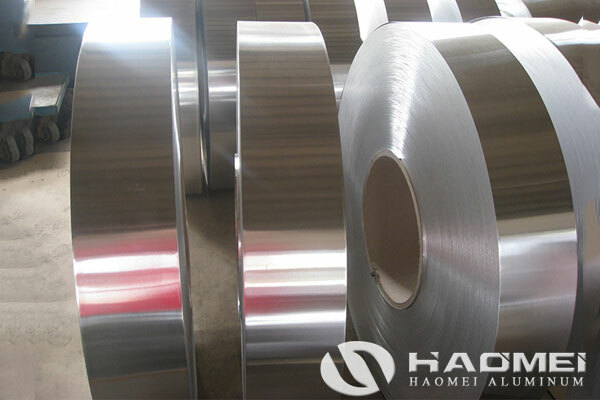 Haomei Aluminum is a trusted aluminum strip supplier in China, thus collect the experience of serving customers for more than 25 yeas, we summarize the application of aluminum strips. Aluminium strips have wide application such as used in transformer winding, for lamp base, for caps, for insulating spacer glass and so on. When used for transformer, the aluminum strips have round edge ans without burr, the grade is 1060 and the temper is O for soft, the thickness of aluminum strip is small, so we can also call it as aluminum foil strip for transformer. Another application is used for lamp base, the grade is 100 and 3004, besides, aluminium strip can also be used for making caps, because aluminum is safe ans non toxic, aluminum strips can used for making pharmaceutical caps.